A solid wood cheval mirror can be a stylish and functional addition to a bedroom, large bathroom or any room that needs an accent piece of furniture. What Is a Cheval Mirror? A cheval mirror is a freestanding tall mirror that is suspended inside a vertical mirror frame. The mirror itself "swings," so it can be adjusted upward or downward as necessary. The swinging feature makes these mirrors ideal for getting a full length look at your reflection, even when the mirror itself is not full length. This is why chevals are sometimes called dressing mirrors. Cheval mirrors have a practical role to play wherever you get dressed. They are great in a bedroom or dressing room and also make a nice touch in a large bathroom. However, these mirrors don't have to be relegated to the rooms where they are most practical. Chevals can be striking accent pieces in any room. The trick is choosing a style and size of mirror that fits best in your place. When it comes to chevals, especially solid wood chevals, size and design matter a lot. Some wooden cheval mirrors combine very thick, heavy frames with a heavy frame around the mirror itself, so that very little space or light shines through between the mirror and the frame in which it swings. On the other hand, other mirrors have thin frames and legs with little or no frame on the mirror itself, so that plenty of light shines through around the mirror, making it less bulky. The former kind of mirror works best in large rooms and rooms with high ceilings while the latter is a perfect fit for small spaces. In terms of style, you can find wood cheval mirrors to fit nearly every taste. From traditional cherry Chippendale style chevals to modern designs with black painted wood frames, it is simply a matter of shopping around until your find the mirror that best suits your design aesthetic. Whether you're looking for a wood cheval mirror for practical reasons or just for a chic touch of style, expect to be spoiled for choice when doing your shopping. If you want to see your mirror before plunking down the cash, consider first browsing at some brick and mortar stores. Chevals are classic pieces of furniture, so you can expect to find them in most furniture and home decorating stores. Ethan Allen, Pottery Barn, Restoration Hardware and other chains usually have wood chevals in stock. If your budget is small, you can even find wood chevals at discount retailers like Wal-Mart, Target and Marshall's Home Goods stores. Everything Furniture - Everything Furniture has cheval mirrors crafted in a variety of materials, including solid wood, in a variety of different styles. You can narrow the parameters of the search by style and size to save yourself the trouble of sifting through unsuitable pieces. 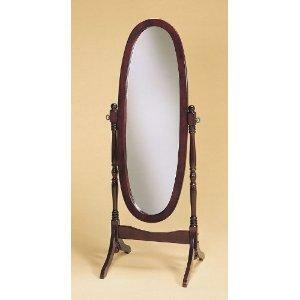 One Way Furniture - One Way Furniture has pages and pages of cheval mirrors in an array of styles and prices. Free shipping is available on some items. Overstock - The selection changes frequently on Overstock, as they sell stock and receive new items for sale. Consider this site to be similar to an online Marshalls or T.J. Maxx. Wood cheval mirrors frequently pop up on here, made by quality manufacturers and sold at a fraction of the sticker price. The Mirror Lady - As you might expect given the name, The Mirror Lady has a good selection of unique chevals. The prices aren't the cheapest around, but ground shipping is free within the continental US and you'll be investing in quality. A cheval mirror is not only useful, but it can also be a unique decorating touch. Find one that suits the size and style of your room, and you'll have a fun and functional piece of furniture.